Do you suspect your restaurant bar might be underperforming? Usually, liquor service offers a pretty high return on investment, but if your bar lacks pizzazz, your customers may not feel the impulse to order drinks. 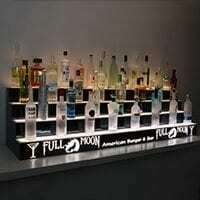 You can easily cure the boring liquor display with a dramatic restaurant bar shelf system infused with LED lights. Plain liquor and glassware shelves lit from above call scant attention to your wares. Place your bottles and glasses on LED lighted bar shelves, though, and your bar could become the centerpiece of your whole restaurant. What better way to inspire orders than to catch your customers’ eyes the instant they step foot in your establishment? With concealed illumination glowing through acrylic shelves and risers, your liquor and supplies generate curiosity and delighted scrutiny. From there, drink orders naturally follow. To really show your pride in your bar, you can have your business logo — or any other nifty design — incorporated into the displays. The internal LED lights create a sensational exhibit that your visitors can’t ignore. To add more excitement, you can program the lights to rotate through a range of colors and intensities. Even set the lights to throb with your background music, if you like. Your lighted bar shelves come with a remote control that enables you to choose a wide array of custom colors and dynamics. It pays to enhance your restaurant bar shelf system with the most intriguing displays. Your liquor bottles set aglow from hidden lighting will certainly captivate your guests and inspire more sales. You can even cut back on your more expensive florescent and incandescent lighting to save money on your electric bill while you’re at it. Once you transform your bar into a magical focal point within your restaurant, it should increase your revenue opportunities. The Stars of Your Restaurant Equipment? Lighted Liquor Shelves! Restaurant equipment is a term that encompasses a diversity of items, not all of which should be strictly ordinary and utilitarian. While preparation tables and ice makers need not sport artistic elements, when it comes to your bar, appealing presentation can set your establishment apart from the run-of-the-mill competition. When your thirsty clientele enjoy a variety of spirits, you want to have plenty to serve. All those liquor bottles should have attractive parking spots around your bar. Few tricks of the trade render your liquor supply more enticing than clever illumination. Not wanting to throw too much light from above — which may detract from the ambiance you would like to maintain — try lighting them from below and behind with lighted bar shelves. A soft glow from the shelving creates a bit of mystery behind the bar and draws the eyes of your patrons without the glare from ceiling fixtures. 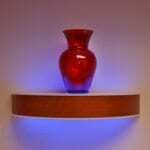 In fact, your lighted liquor shelves can allow you to switch off some of your more expensive lights. Continue reading The Stars of Your Restaurant Equipment? 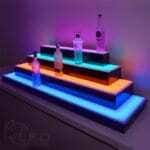 Lighted Liquor Shelves! If drinking were a less popular pastime, we wouldn’t see bars on nearly every corner. However, since bars crowd the landscape, you need to set yours apart from the run-of-the-mill competition. 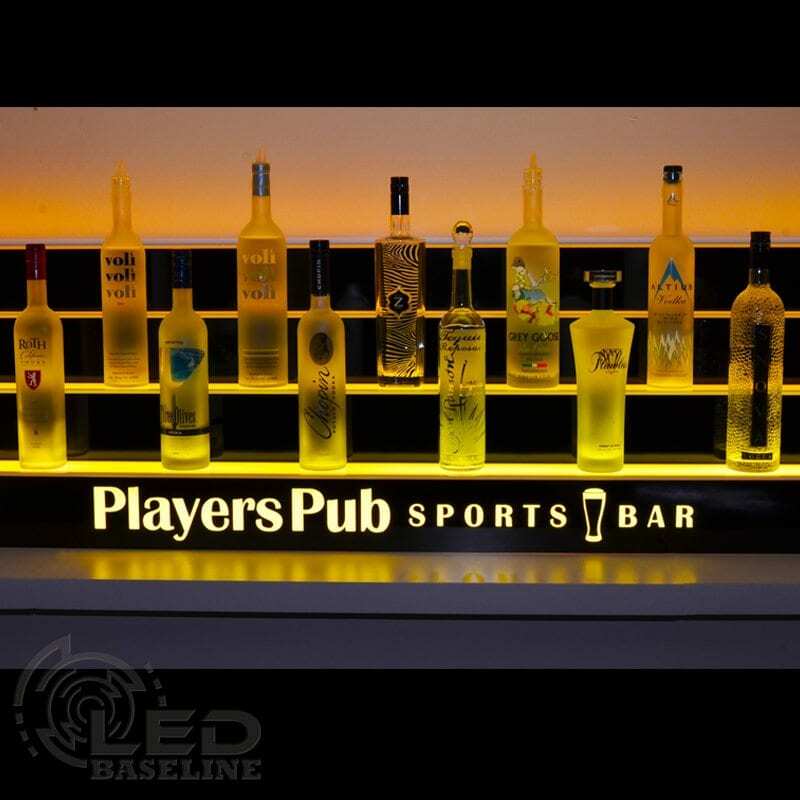 Of the many creative ways you can distinguish your drinking establishment from all the others, adding LED liquor displays may bring the most return on investment. 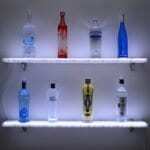 What Do LED Liquor Displays Bring to the Party? Illuminating your liquor bottles enhances their appeal. Even plain old bottles with no crafty styling enchant the eye when light shines through the liquid. Of course, the fancier the bottle, the better the display. You might say, “I already have florescent tubes lighting up my shelves.” But, do they change color? 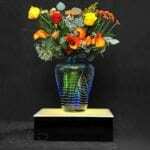 Can they generate a kaleidoscope of hues to fascinate your patrons and keep them placing orders? Do your tubes light from under and behind the bottles, or do they just throw light on the front of your liquor bottles and call it a day? Won’t They Cost Too Much to Operate? Because LED light merely sips electricity compared to florescent and incandescent bulbs, you actually save money while displaying your liquor. Plus, when you consider the fact that you can set your wares aglow for pennies on the dollar compared to the other methods, you can set up larger displays and eliminate some of your other lighting fixtures while you’re at it. You get savings on top of savings. To really turn up the heat on your bar’s appeal, you can tie the pulse of the music to your LED’s with your easy-to-use remote programmer. You’ll impress your patrons with the high energy in your business by syncing your mood lighting and music for total sensory stimulation. You know that a stimulated crowd is a spending crowd. 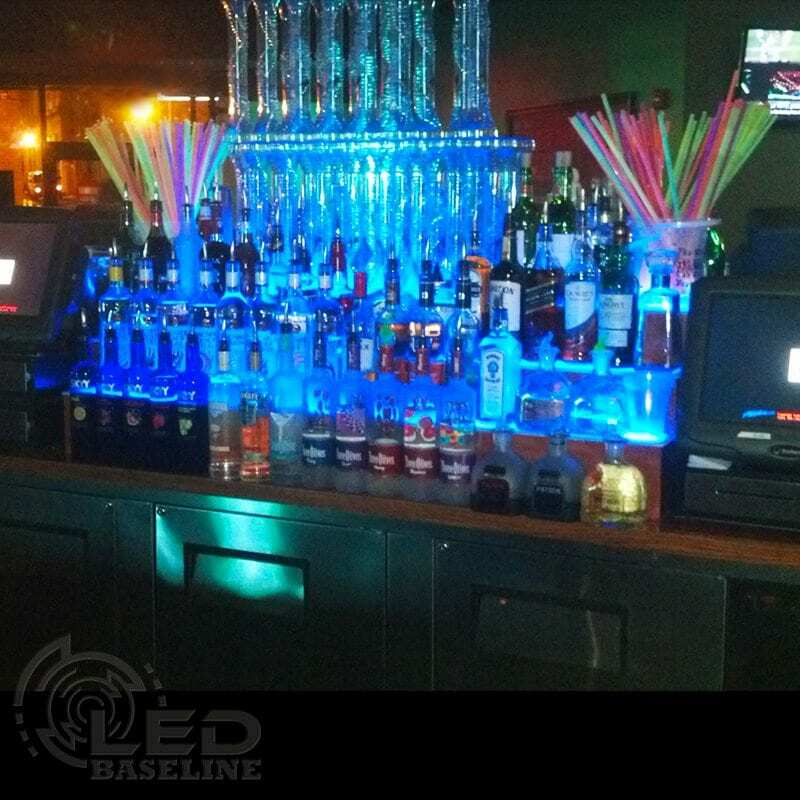 As word spreads that you operate a boss bar, you’ll be glad you invested in LED liquor displays. Psychologically, a well-stocked bar inspires people to order drinks. Conversely, people hesitate to order drinks if they feel you have little to serve. It makes sense for your business or hospitality goals to treat your guests’ eyes to a large, cleverly-lit display. If your back-bar counter space is limited, go up the walls with lighted liquor shelves. The more visible the options, the more likely you’ll make sales (even if you don’t charge). 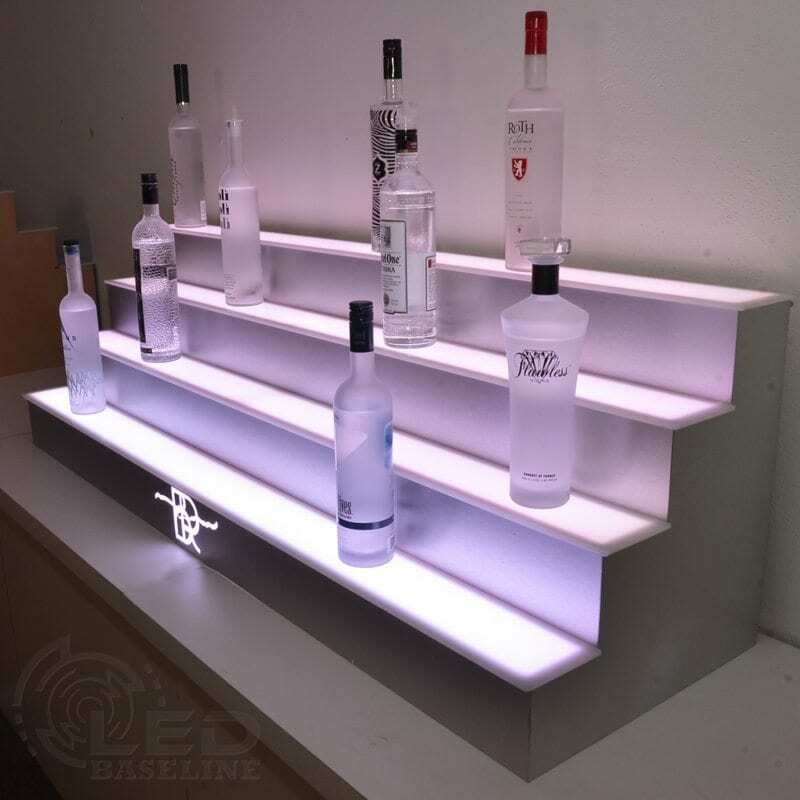 By using LED lighted shelves with hidden brackets, your liquor bottles seem to float against the wall and glow with a life of their own. This special illumination renders your liquor in the most appealing manner possible. Program the lights to rotate custom colors that you mix on your handy remote, and your patrons will remain transfixed by your displays. The longer they loiter at the bar, the greater your opportunity to keep their glasses re-filled. The beauty of illuminated liquor shelves rests in their functionality. 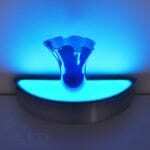 They provide mood lighting that promotes an intimate atmosphere. Because these shelves come custom-made to your specification, they also serve as decorative elements. You handle two marketing requirements at the same time: spotlighting your merchandise in a tastefully decorated room. A wall mounted liquor shelf solves space problems for a cramped bar. A collection of shelves can elevate the level of decor and also provide a captivating color show to capture the attention of your customers. You should add several of them to your lounge, nightclub, restaurant or home bar today. If you enjoy your happy hours at home and love to host parties, your home bar serves you like a faithful friend. 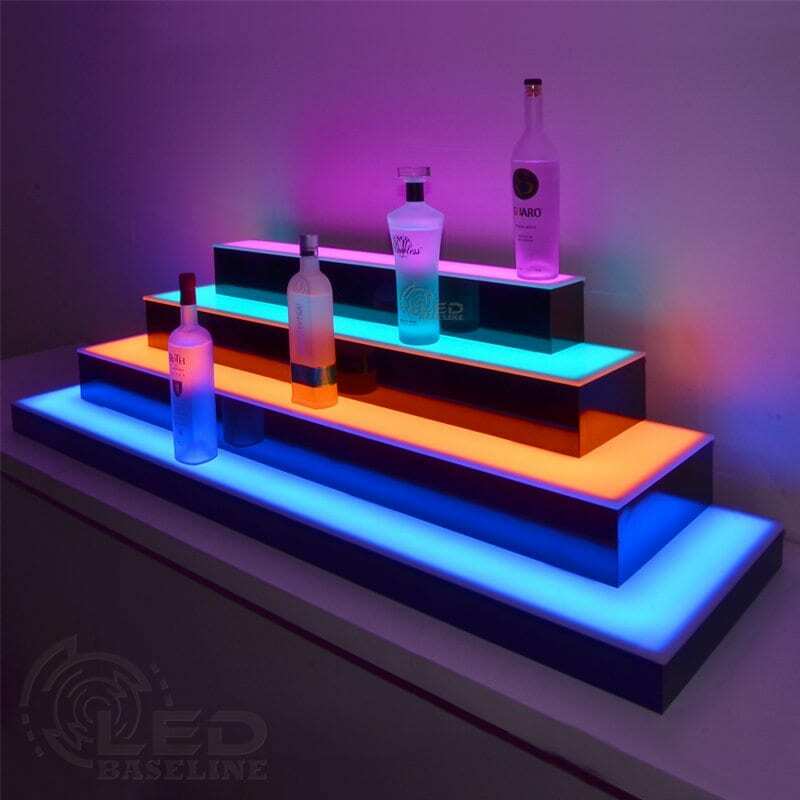 Why not give your old buddy the gift of at least one set of LED lighted liquor shelves for home bar rooms? 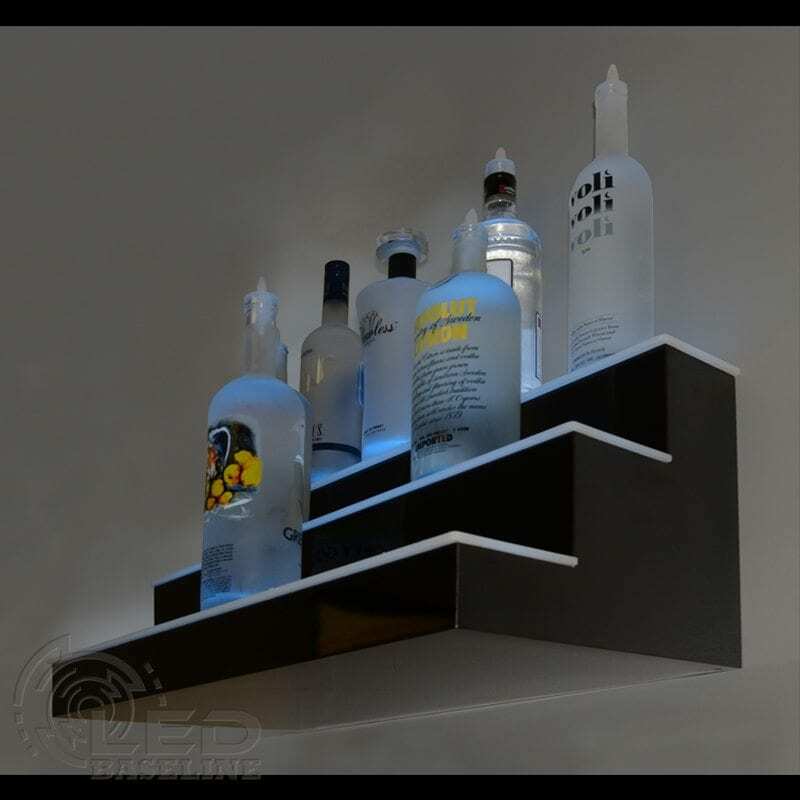 These custom shelves illuminate your drinking hole and create a snazzy place to store your supply of adult beverages. If your home bar exists in the depths of your man cave or entertainment room, it’s important to keep proper light levels. Like the atmosphere at a commercial theater, show time requires subdued lighting. But you never want your guests to stumble and fumble while serving themselves refreshments. Lighted liquor shelves come in quite handy in this situation. The LED strip lights that illuminate your stock from below or behind provide the perfect colorful backlighting without glaring over the main attraction. With the programmable remote, you can dim, brighten or rotate colors as desired. In a more lively setting, your lighted home bar shelves invite the eyes of your guests, and their bodies quickly follow. They’ll gather at your bar just to witness the remarkable display of bottles lit from within by your shelves. Soon, your parties will become the events everyone yearns to attend. While you can always resort to older lighting schemes, why generate the excess heat and jack up the energy bill? The better option suffers none of those drawbacks. LED technology pulls very little electrical juice and remains cool enough to touch, making your parties easier on the budget. Your shelves can remain lit hour after hour without concern. If you’re looking for the best way to amp up your bar, go for lighted liquor shelves for home bar settings. You’ll be glad you did. 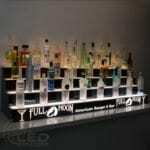 A lighted bottle display can convert any home bar from merely functional to an eye-catching feature in your home decor. But such displays can serve you well in other areas of your living space, as well. Although custom-built illuminated shelves can take as many attractive forms as you can imagine, even basic designs add convenience wherever you want illuminated storage. Searching for items in your crowded pantry can frustrate your dinner schedule; however, by adding shelving with incorporated LED lights will wash your bottles, cans and boxes with energy-sipping illumination so you can easily find your supplies. Because LED lights for shelves can produce many different colors, you could even organize your pantry with a color-coded system, making retrievals more rapid yet. Perfumers try to outdo each other with beautiful and unique bottle designs. If you have a prized collection of perfume bottles, why not move them off your vanity or dresser onto floating display shelves? A lighted bottle display will make your interesting arrangement shine from within. Hung in the bathroom where guests and family alike can view them, your stock of perfume will bemuse as it also fills the room with the pleasant scents lingering around the bottles. When your decorating accessories rise above the level of knick knacks, you should highlight them. Shelves that often support liquor in bars can provide the perfect foundation and backdrop for your art pieces, too. Lit from within, the shelves can serve as single stands for solitary sculptures or stacks for multiple objects. Adding a slowly rotating mix of colors will contribute to the appeal of your ornaments. Lighted bottle displays aren’t just for liquor anymore. Basic units can boost the efficiency of your meal preparation while decorative shelves can open up space on your vanity and create exhibits for all of your smaller art pieces throughout your rooms. In the competitive world of liquor sales, it pays to have an advantage. 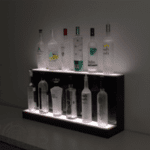 An LED lighted liquor shelf — or many — can elevate the appeal of your liquor store to customers. When choosing a liquor store comes down to a patron’s coin flip, that little extra excitement generated by lighted displays can make all the difference in the world. Although the concept of product displays featuring lights dates back probably to the invention of electric light bulbs, using light emitting diodes only came around fairly recently. Incandescent fixtures, florescent bulbs and spotlights involve more space and planning to deploy. LED lighting, on the other hand, offers cool versatility unmatched by other illumination systems. Incandescent and florescent bulbs require the heating of a gas enclosed by heat-tolerant glass. The inherently hot and delicate surface of the fixtures mean special handling and limitations on shelving material. They also pull a substantial amount of juice when lit. However, LED technology relies on the properties of semiconducting material and electricity to produce photons in a much different process. With almost no heat from glass-enclosed filaments to watch out for, an LED lighted liquor shelf can take many shapes and use translucent components other than glass. Plus, the electrical draw is so minimal, they can serve your display far longer than any other light source for far less expense. 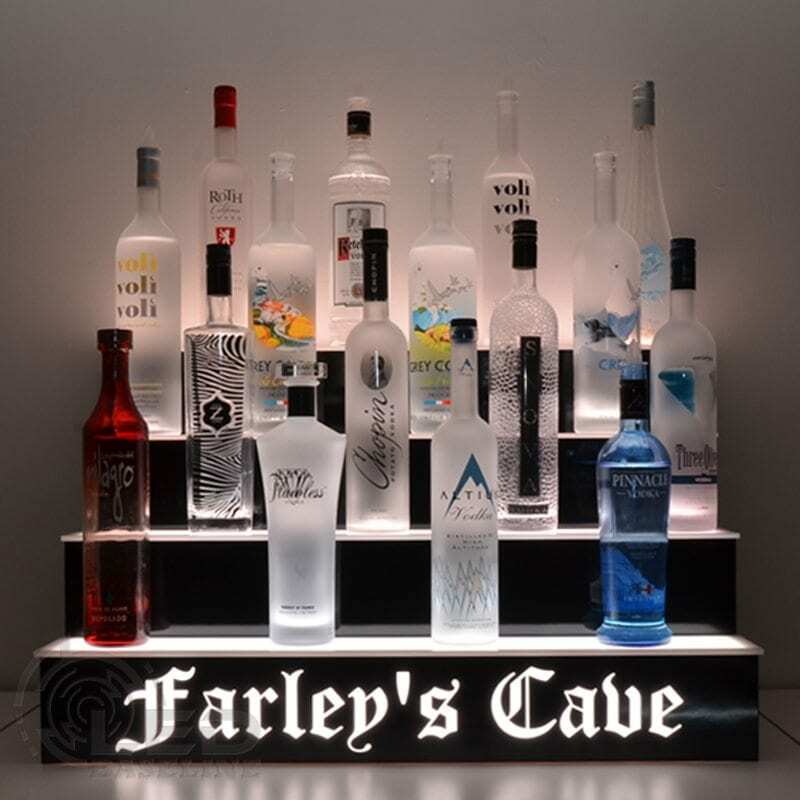 With the display advantages of LED lighted liquor shelf arrangements, your store can gain a leg up on your competitors. Shelves washed with light from below create a certain classy ambience that customers enjoy, even if on a subconscious level. Next time they plan to shop for liquor, they just might skip the coin toss and head straight to your store, proving the power of LEDs. 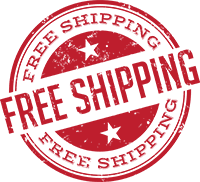 Shop today at our online store. 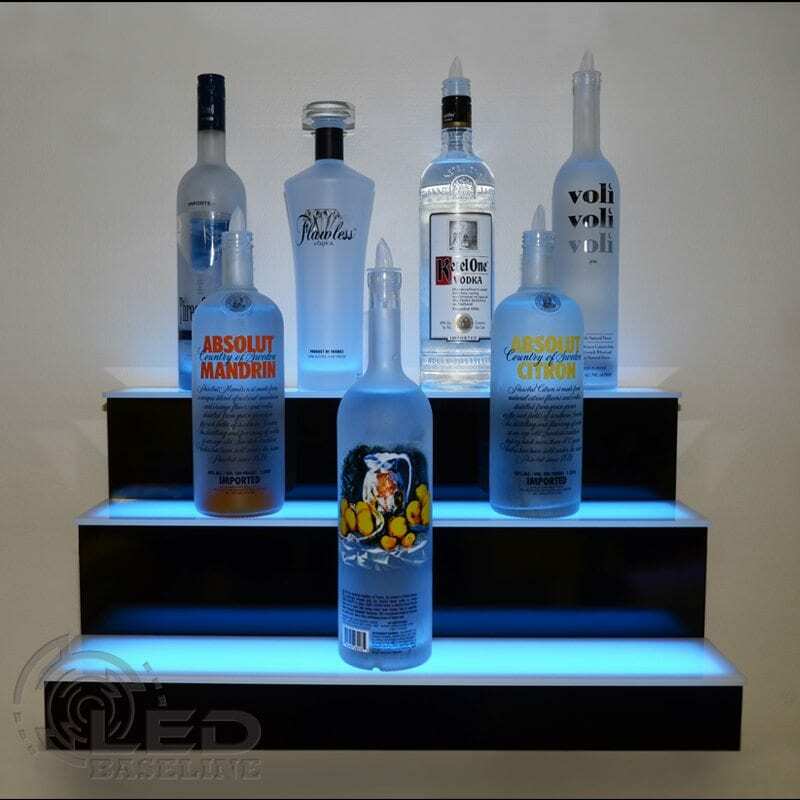 Who Can Benefit from Lighted Liquor Displays? 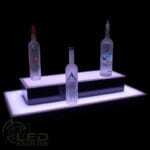 Lighted liquor displays can transform any ordinary bar into one that draws a more upscale clientele. With your liquor awash in a soft glow from below, your patrons can view the variety of your offerings in a more pleasing and interesting tableau. Who can benefit from adding these special displays? 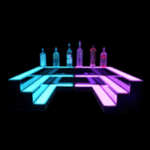 Because the LED lights can be programed to rotate colors, fade in and out and even pulse to the beat, nightclubs obviously could benefit from lighted liquor displays. Designed for creative dynamics, and with a hand-held remote controller, these liquor displays join the party. Bars in restaurants should attract customers whether they stay to dine. Drawing customers’ eyes to the bar makes for a smart business plan. Fancy liquor bottles up lit on their shelves present a sight for diners and drinkers to see and remember. Bowling and beer go together like fingers in grip holes. You can order your liquor display shelves with the logos of the beer, whiskeys and wines you sell. Set along the risers of the lighted liquor shelves, thirsty bowlers can see your product offerings while they wait to order. Guests and locals alike love to visit a pleasant place for happy hour. When you elevate your liquor on lighted displays, you enhance the ambience in your bar, attracting the after-work crowd as well as the weary traveler. 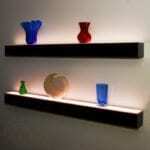 An LED lighted shelf exudes class whether it’s in a bar, art gallery or opera house. Radiant floating shelves should do more than just transform artful liquor bottles behind the bar, but also illuminate fine art pieces for sale. When the entertainment comes to your house, why not wow your friends and family with your tasteful liquor display? In a home theater, man cave or anywhere you set up a bar, lighted displays enhance the atmosphere in the comfort of your own home. 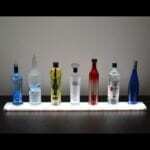 Any venue where liquor flows can certainly benefit from lighted liquor displays.